The 2nd annual GLOBALFOUNDRIES Technology Conference (GTC), held in Santa Clara - CA on August 30, provided a rare opportunity to hear from leaders of each of the three largest EDA companies, along with the CEO of the largest semiconductor IP company, gathered together on the same stage to discuss a wide range of issues that will impact the future direction of the electronics design ecosystem. Mojy Chian, the Senior VP for Design Enablement at GLOBALFOUNDRIES, moderated the panel discussion and presented a series of questions to the executives for nearly one-hour, followed by several questions from the audience. Aart de Geus, CEO of Synopsys, Inc. 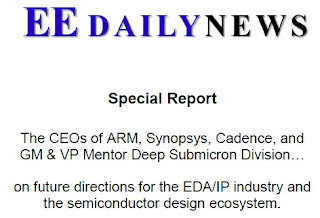 The EE Daily News has published a 20-page special report reviewing, in its entirety, the CEO/executive panel discussion at GTC 2011. The report includes an edited transcript of the one hour plus Q&A session, along with an analysis and summary of the key takeaways. The report will provide valuable information to EDA users, competitors, EDA financial analysts, and managers of companies throughout the EDA/IP/manufacturing ecosystem. 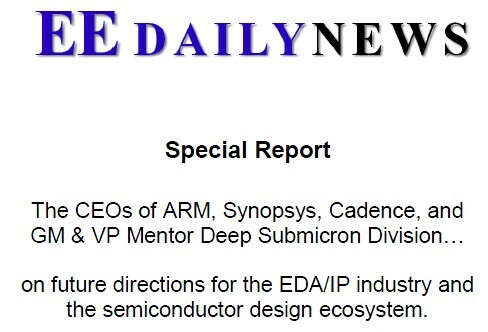 Cadence CEO Lip-Bu Tan says Google, Facebook, and Cisco will follow Apple into designing their own ICs. Is there an opportunity for “ARM inside” branding to differentiate silicon IP, like “Intel inside” for PCs? Synopsys CEO Aart de Geus says we are in a transition from Moore’s Law scale complexity to systemic complexity. de Geus says that risk adds a 3rd dimension to design tradeoffs. Mentor Graphics’ Robert Hum calls for deeper alliances and cooperation across the industry. ARM’s CEO says no magic wands - concurrent development of tools, process and IP is critical. Synopsys’ de Geus says a fundamental change has occurred at 28nm. GLOBALFOUNDRIES asks - Are there other things that EDA, the IP companies, and the foundries need to do together? ARM’s CEO, citing example of Linaro, encourages reluctant EDA executives to see the value in horizontal collaboration. EDA execs expound on why analog is so hard. Audience question asks… how can EDA/IP get a bigger piece of the mobile industry pie? Cadence’s Tan says customers want Groupon, in response to changing the EDA business model. EDA execs on design in the cloud.